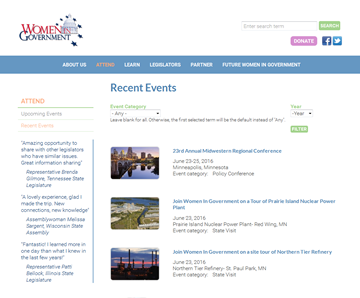 The Women in Government website was a kludgy Drupal 6 site that was not properly implemented by their previous developer. The staff were unable to make changes to many parts of the site, and we had to assist them with setup of new sections of the website. The site was also desperately in need of content strategy, with a significant amount of content being out of date or difficult to consume. We supported WIG for several years on the old platform, and in 2015 we did a major upgrade to Drupal 7 along with a complete site redesign. Content strategy was first and foremost on our mind, so we rearchitected the site and retired hundreds of pages of content. The site is now a bit light on content, but this activity opened the door to new thinking, and new content will come online throughout the year. We also provided WIG with a member registration process that will allow access to a private document repository system built into the website. This will generate more interest in and more traffic to the site on a regular basis. The site is now mobile-friendly, and exudes the color and vitality requested by WIG to better reflect their audience and objectives.